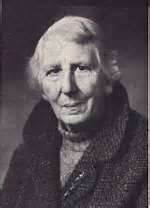 Author: Patricia Wentworth published 32 volumes in the Miss Silver series between 1928 and 1961; she also wrote dozens of non-series novels. 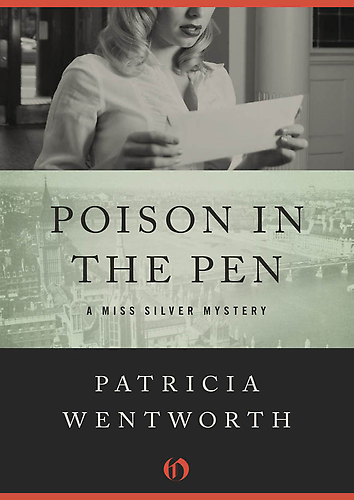 The Miss Silver novels are all classic mysteries; Wentworth’s other novels are sometimes mysteries, sometimes gentle thrillers, or “woman in jeopardy” novels. 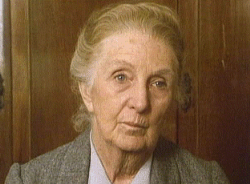 Her first novel was published in 1910 and was set against the background of the French Revolution. Most of her books feature a romantic subplot and a beautiful young woman who is in some way menaced. Publication Data: As noted below, to the best of my knowledge, the first edition of this novel is from the United States, Lippincott in 1955; the first UK edition appears to be Hodder and Stoughton, 1957. There may well be an edition I’ve overlooked; there are many, many paperback editions from both the United States and the UK. Spoiler warning: What you are about to read does not discuss in explicit terms the solution to this murder mystery but it will certainly give away large chunks of information about its plot and characters. Please read no further if you wish to preserve your ignorance of its details. You will also probably find here discussions of the content of other murder mysteries, perhaps by other authors, and a similar warning should apply. 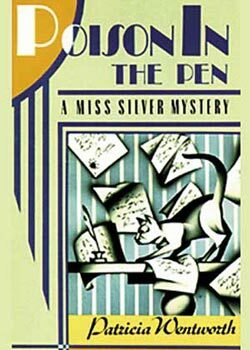 Poison in the Pen begins the same way as many of the other volumes in this long series; handsome young Detective-Inspector Frank Abbott of Scotland Yard comes to visit his old friend Miss Silver in her lovingly-detailed drawing room. Frank has dozens of cousins and the plight of one of them is something that he wants to bring to Miss Silver’s attention and perhaps get some advice or assistance. Joyce Rodney has a delicate child and a husband who died while working in the Middle East; she was grateful when her late husband’s elderly cousin, Miss Renie Wayne, offered her a home in the village of Tilling Green. The trouble is that Joyce has been getting vicious anonymous letters — and she’s not the only one in the village receiving them. The local Manor is under the charge of Colonel Roger Repton, who is impoverished, and who is the guardian of young Miss Valentine Grey, who is wealthy. Valentine is about to marry Gilbert Earle, of the Foreign Office, who will be able to use her money since he has five unmarried sisters who need dowries when he inherits the title of Lord Brangston. Roger’s highly decorative but completely bitchy young wife Scilla also lives at the Manor, as does Roger’s unmarried sister Miss Maggie. 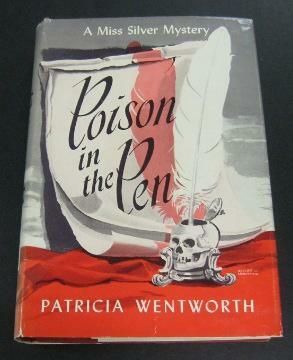 The poison pen letters accuse Joyce of trying to attract the attentions of Gilbert Earle. 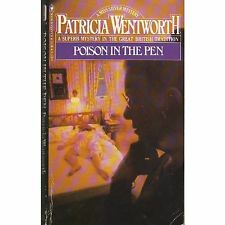 A few days later, Miss Silver reads in The Times that a young woman who ekes out a living as a dressmaker, Doris Pell, has been found drowned on the grounds of the Manor in a stretch of “ornamental water”; she too has been receiving vicious anonymous letters and is felt to have committed suicide. The Yard has been called in, and Miss Silver is brought in by them as a kind of spy. She travels to Tilling Green “on vacation” and takes a place as a “paying guest” in Miss Renie’s “Willow Cottage”; Miss Renie obligingly clacks her tongue until Miss Silver has a complete picture of the affairs of the village, including eccentric Mr. Barton, who has a badly scarred face, does his own housework and has seven cats. Although Valentine Grey’s wedding is imminent, Miss Renie dwells upon her first love, the adventuresome writer Jason Leigh. Meanwhile, village gossip is making the rounds that the village kindergarten teacher, Connie Brooke, knows who wrote the poison pen letters that drove poor Doris Pell to drown herself. Connie is deputized to take the place of a sickly bridesmaid at the wedding rehearsal — because the dress will fit her! — and later at a small party at the Manor is seen to have been crying. When she talks about her sleeplessness, Miss Maggie offers her some sleeping pills left over from an illness a few years ago. As is inevitable in a Miss Silver novel, Valentine’s true love Jason Leigh picks this moment to return to her life and the rest of the novel will concern her difficulties in breaking off her imminent wedding with Gilbert Earle and admitting that she has always loved Jason; Valentine tells Jason, in a secret late-night meeting, that the wedding will be called off. What will help is that, immediately after her own secret meeting, she overhears Gilbert having a secret meeting with Scilla Repton, who is the true object of his affections; unfortunately, Gilbert must marry for money and Valentine is his best hope, he tells Scilla. 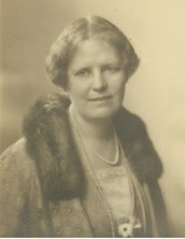 Upon her wedding morning, Valentine receives a poison-pen letter suggesting that Gilbert had also been carrying on with the late Doris Pell (and Scilla Repton) and also had already married in Canada years ago. But the entire village is completely in an uproar immediately upon the discovery of Connie Brooke’s dead body. Valentine tells Gilbert she can’t marry him. Miss Silver, of course, realizes that if Connie Brooke did actually know who the poison-pen writer is, her death may not have been an accidental overdose of sleeping pills but … murder. Miss Silver brings Scotland Yard up to date, and keeps digging into the tangled affairs of the village as only she can; Miss Renie’s constant chatter contains many nuggets of information, and it is clear that, in this particular village at least, everyone’s comings and goings and opinions and past actions are the constant subject of discussion for most of the villagers. Meanwhile, Scilla Repton learns that Gilbert is now free, and quarrels with her husband as a result of her having been indiscreet about telephoning him. Colonel Repton tells her he has had anonymous letters about Scilla and Gilbert that arouse his suspicion — he tells her to get out and intimates that he too knows who wrote the letters. This information is immediately flashed around the village due to a helpful and gossipy maid, Florrie. The next day, Sunday, there is the weekly Work Party (the village women make clothes for the less fortunate); Scilla encounters a woman who has been well-known to be unrequitedly in love with Roger Repton, Miss Mettie Eccles. Mettie takes Roger in a cup of tea to his study, where he is avoiding the gaggle of needlewomen, while Miss Silver comforts Roger’s sister Maggie. But when Mettie returns to see if Roger wants another cup of tea, he is found to have been poisoned by cyanide. 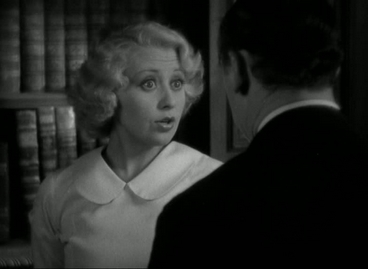 Mettie immediately and loudly accuses Scilla Repton of the murder and spills the beans to all and sundry about their estrangement. Miss Maggie collapses with the shock and Miss Silver helpfully moves in to take care of her and the household, enabling her to be present at all the interviews with Scotland Yard. The eccentric Mr. Barton proves to have been one of the last people to see the late Colonel Repton, and proves to be a woman-hater who testifies that the Colonel was not considering suicide, as Scilla has vaguely suggested. 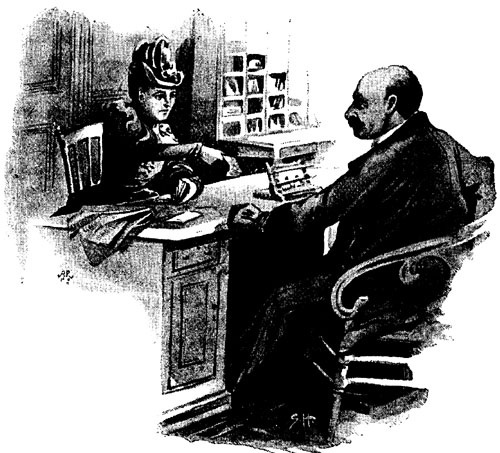 Miss Silver discusses the case further with Scotland Yard and builds a tentative case against a number of people, merely pointing out the possibilities. But it is not until she goes to interview the first victim’s aunt, Miss Pell, that she learns a crucial fact about Doris Pell’s last afternoon of work that may explain everything that has happened. She discusses the case with a few more people and finally ends up confronting the murderer directly in a house with a strong smell of gas. Everything comes to a head in a dramatic climax and Miss Silver takes the final chapter to explain the entire complex plot to Detective-Inspector Abbott. One of the principal virtues of the long Miss Silver series is that each book contains a set of constancies which anchor the reader. In the beginning of each book, we always see Miss Silver’s drawing room and go through a litany of the specific Victorian pictures and pieces of furniture which exemplify her comfort and success. In each book, Miss Silver’s wardrobe, very nearly unchanging over the decades, is mentioned; the black velvet coatee that she reserves for wear in draughty country houses, the details of her dresses and hats and heirloom jewelry. We know the names and habits of her nieces (in this volume, the foolish Gladys Burkett is thinking of leaving her husband Andrew Robinson), the excellence of her maid Hannah at making scones, her constant cough when she wishes to reprove someone, and the ever-present knitting (with needles held in the Continental style low in her lap) — we always know what she is knitting, in what colour of wool, and for whom. And every Miss Silver novel is, in its own way, very similar to all the others. There is always a beautiful young woman who is unhappy. (She frequently has caramel-coloured eyelashes.) 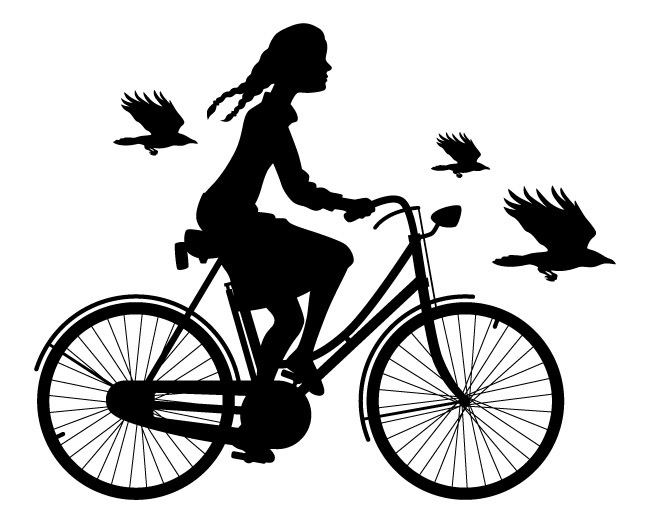 The young woman’s romantic life is in some way snarled or frustrated. There is always a plot which even the simplest reader can discern is moving towards disaster; either someone is having an unfortunate romantic affair, or someone is about to marry the wrong person, or, in the classic pattern of Golden Age mysteries, a wealthy person at the centre of the action is quarrelling with relatives, changing testamentary dispositions, and/or uncovering crimes against a large estate. Miss Silver is called in — either by Scotland Yard or some interested party — and somehow embeds herself in the social fabric of the people involved in the case. And then she talks with people. She talks with lords and ladies, maidservants and mechanics, and most often other elderly women, who are seen to be in command of all the essential facts. Miss Silver, in fact, is a wonderfully skilful listener, and she encourages people to go into incredible detail about things which seem unimportant but which later turn out to be essential. In this volume, for instance, the reader who has been paying very close attention is aware of the colours of the bedroom carpets of four people — one of whom is the murderer. And the colours of those carpets are of crucial importance upon a very minor but vital point. In fact, it is clear that these novels are written for women; no doubt about it. They contain endless details of what women are wearing; Scilla’s clothes, immediately after the death of her husband, are a case in point. 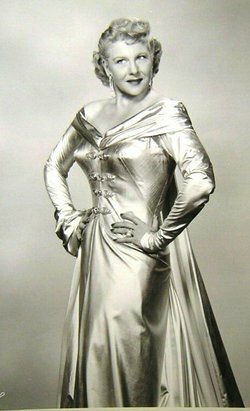 Indeed, Miss Silver spends her life being considered negligible by nearly everyone, which enables her to listen to all the gossip unnoticed from the corner of the room. And this, I suggest, is meant to appeal to women readers. 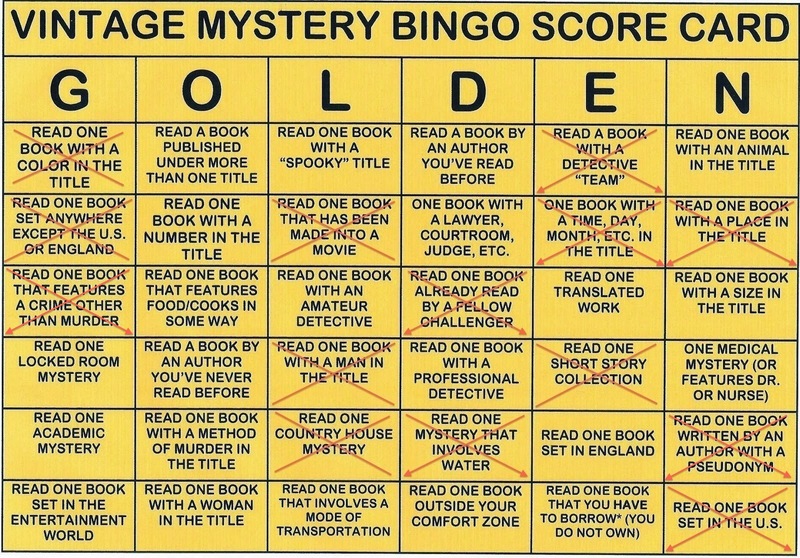 I’ll even advance that women readers who are habitually overlooked in their everyday lives are meant to see themselves in these novels, being able to solve mysteries that baffle the police by dint of knowing what colour their next-door neighbour’s bedroom carpet is. Miss Silver is seen as powerless, elderly, useless and gossipy, but she commands the respect of high-ranking police officers and is not above physically confronting the occasional murderer. Indeed, she focuses the abilities that most of the world sees as useless — gossip, knowledge of masses of tiny details about the lives of others, memory of everyone’s past — and turns them into assets in plots which are designed to show these talents as crucial. I must confess that I’ve always found the Miss Silver novels charming and relaxing. 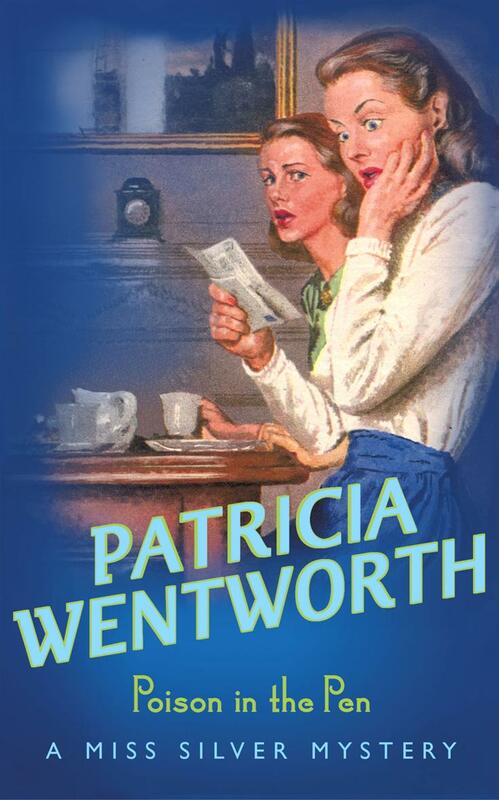 Although there is little plotting that is so complex in the books that it will trouble the experienced mystery-solver to figure out, occasionally Wentworth manages to slip a suspect under the radar; this is one of those novels, I think. It was so long ago when I first read it that I can’t remember if I was surprised or not, I think it’s entirely possible that even experienced solvers will miss the key clues, as they are buried in a morass of detail about the everyday lives of the villagers. 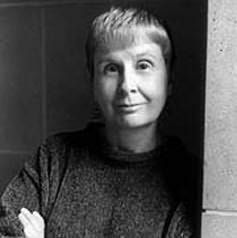 I think one of the reasons that I enjoy the novels so much is that Wentworth has a huge skill at depicting character through detail; we see people using certain language when they speak, or wearing certain clothes, or even performing certain everyday activities, and we know what we are meant to know about them. There are few cardboard characters in these books; even minor walk-ons are given distinguishing factors that make them believable. (In this book, look for the character of Miss Pell, aunt to the first victim; she’s only seen for a few pages, but it’s her religious convictions that explain why she’s withheld information, and this is delightfully and subtly portrayed.) Specifically, Wentworth shows us character by way of pinpointing social class. The reader can tell with absolute certainty where individual characters fit into the social matrix of English village life; this is shown by what they wear, and say, and do. As I’ve remarked elsewhere, this focus upon social class is part of Wentworth’s charm, because I believe she does it with the assured skill of an expert in small details (the precise height of Scilla Repton’s heels shows that she’s not really “to the Manor born”). 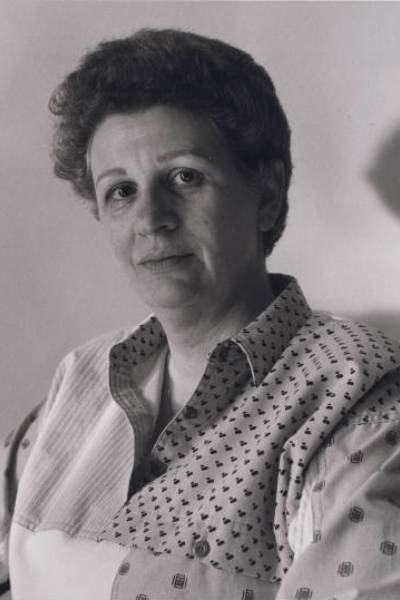 And I believe that the reason Wentworth had such a long career, and has remained constantly in print for a century, is that she uses this skill at writing about small details that reveal class in order to write books that reassure people about their own place in the social system. It is easy to see where Wentworth’s readers are meant to fall — they are above the humblest villagers, the dressmakers and shopkeepers and housekeepers, and very nearly the equal of the lords and ladies of the manor, if it were not for the accidents of birth and inherited money. The humblest villagers are shown warts and all, and the reader can easily feel superior to their low-class modes of expression and focus upon the quotidian and the mundane. The middle classes, artisans and professionals, are displayed sympathetically, for the most part. Sometimes they are bravely facing financial adversity, sometimes they are truckling to their wealthy relatives, or sacrificing their romantic and personal lives for the sake of children or invalids. Even Scilla Repton here is not innately evil; she is a woman out of her natural milieu and thus eventually a figure of pity rather than scorn. In fact, she is no different than a number of her neighbours, the difference being mainly her “husband’s long purse” and her title. Note the delightful tiny touch that her diamond and ruby necklace is “rather dirty”; you see, even the upper classes aren’t as clean as we might think. There is a strong focus in the series upon Miss Silver’s Victorian upbringing and morals; she is a constant benchmark of high moral standards and the utmost in propriety. (In this volume, for instance, there is a sympathetic young woman who asks Miss Silver in a friendly way to call her by her first name; Miss Silver refuses, because it is inappropriate in the social context.) By having this benchmark constantly in place, the behaviour of others has something against which it can be measured. Although it’s rarely explicit, Miss Silver is constantly assessing people to see if they are acting according to the best standards of behaviour appropriate to their social class. Are titled women helping and guiding the community? Are poor women clean and honest? Are middle-class women dressed appropriately for their situation, and faithful to their husbands? And it is never enough that Miss Silver identifies murderers and other criminals and restores order, with the help of Scotland Yard. In Miss Silver novels, virtue is rewarded and transgression is punished. People who are morally unsound are punished or reproved by the end of the book, regardless of whether they are criminals or not; sometimes they see the error of their ways, and sometimes they leave the happy village and find a milieu more appropriate to their moral level. And that is why I enjoy Miss Silver novels, regardless of the difficulty of the mystery plots or the occasional less-than-inspired choices of plot twists. (Indeed, Miss Silver novels are frequently based around a wealthy person who quarrels with his entire family, identifies a criminal within his household, frustrates a young woman’s marriage for love, and rewrites his will all within hours — the evening of his death, everyone troops in and out of his final resting place at five-minute intervals and lies like troopers about when and why.) Miss Silver is like comfort food, in a moral and social sense. Everyone knows their place and returns to it, once order has been restored. Characters do not break the boundaries of their pigeonholes; love almost always triumphs over adversity. Miss Silver is the restorer of equilibrium in a fluffy pink bathrobe and a hairnet. 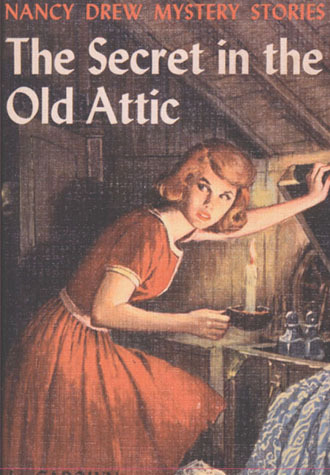 The very earliest Miss Silver novels are quite antique, but Patricia Wentworth wrote roughly the same novel over and over between 1937 and 1961. If you read them all, you will either be charmed or repelled by the constant repetition of certain elements — by your 25th or 30th such novel you will be able to chant the names of the pictures upon the walls of Miss Silver’s drawing room along with the narrator, and await with interest the appearance of Miss Silver’s bog-oak pearl brooch and her black velvet coatee. I’m one of the ones who is charmed, like a young child who insists that his favourite fairy tale be read verbatim and unvarying every evening. If you are not charmed by what I’ve suggested, simply turn away; expressing your disapproval would lead to a hortatory cough from Miss Silver and you would feel compelled to apologize and mend your ways. To the best of my knowledge, the first edition of this novel is from the United States, Lippincott in 1955; the first UK edition appears to be Hodder and Stoughton, 1957. I find this a little odd because the author was British, but — these things happen. Both the US and UK first editions are, to my eye, relatively undistinguished; of course a first edition is always worth having, and as of today a Fine copy in a chipped jacket is selling from an American bookseller for $50. I’m a little surprised at how inexpensive this is, comparatively speaking. 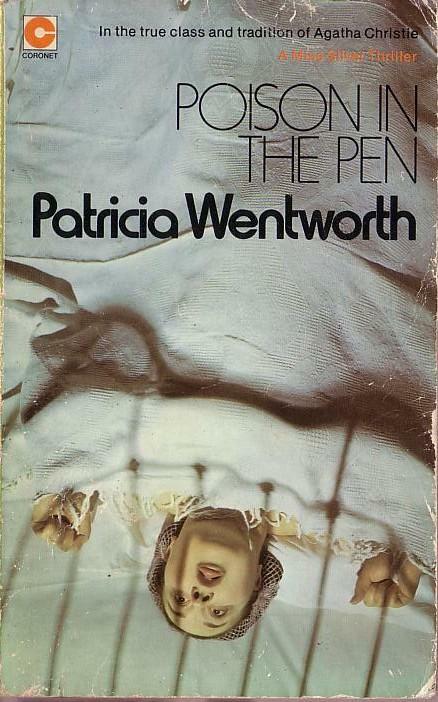 If I were collecting a full set of Wentworth, and couldn’t afford first editions, I would be looking at paperbacks; either unusual editions or interesting ones. Unfortunately this particular title appears to have fallen through the cracks of my favourite possibility; in the late 1950s/early 1960s, Pyramid in the US put out a paperback edition of some Miss Silver novels that made them look like Gothic romances, complete with the girl in the billowing white garments running away from the spooky old castle (which, of course, has nothing to do with the contents of the book). This book doesn’t seem to be one of that series, sadly. One of my favourite uniform editions of Wentworth was from Coronet in the late 70s/early 80s; the covers featured a photograph of a dead body, reproduced from the action of the novel with some degree of fidelity. This one is of the corpse of Connie Brooke, I believe (the cover is nearby). There is a 2013/14 uniform edition from Hodder & Stoughton in the UK* which I think is very attractive; the publishers have gone to some trouble to counterfeit “period” illustrations and, if they manage to produce all of the Miss Silver novels in this format, I think I’d definitely be collecting it. They are relatively inexpensive at the moment since they are in print, and although I doubt they are available in the United States because Bantam seems to have the American rights, I doubt they’d be too expensive to bring in from Canada, where I see them cheaply in used bookstores. I’ve added an illustration here of this volume’s bright blue cover showing a young woman recoiling in shock from the contents of a letter. *My first publication of this post today contained an error which was immediately caught by my alert friend John of the excellent blog Pretty Sinister; see the comments below. I’ve made an emendation. I won’t trouble to correct my opinions, even the frequent silly ones, but I do like to be as accurate as possible about facts. 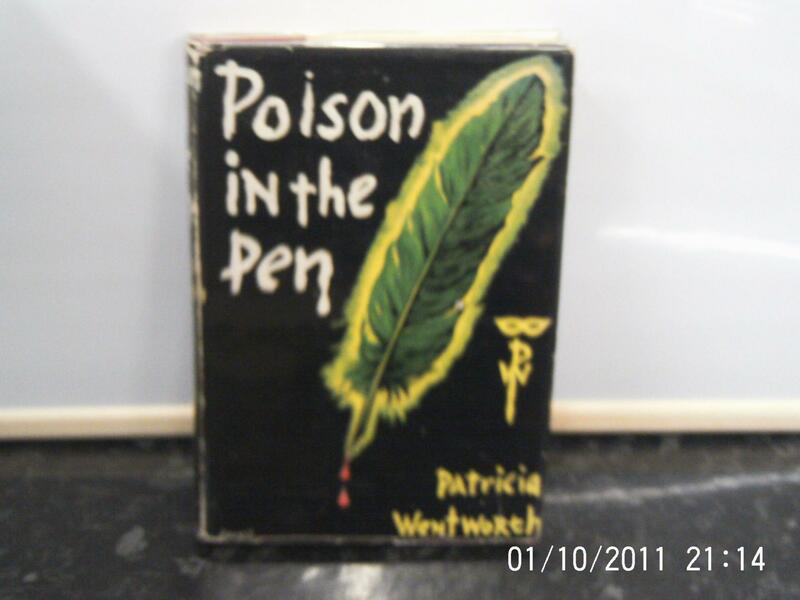 This 1954 volume qualifies as a Golden Age mystery; third under “G”, “Read one book that features a crime other than murder.” The primary focus of the book is the sending of poison-pen letters and a death which is thought to be an associated suicide. 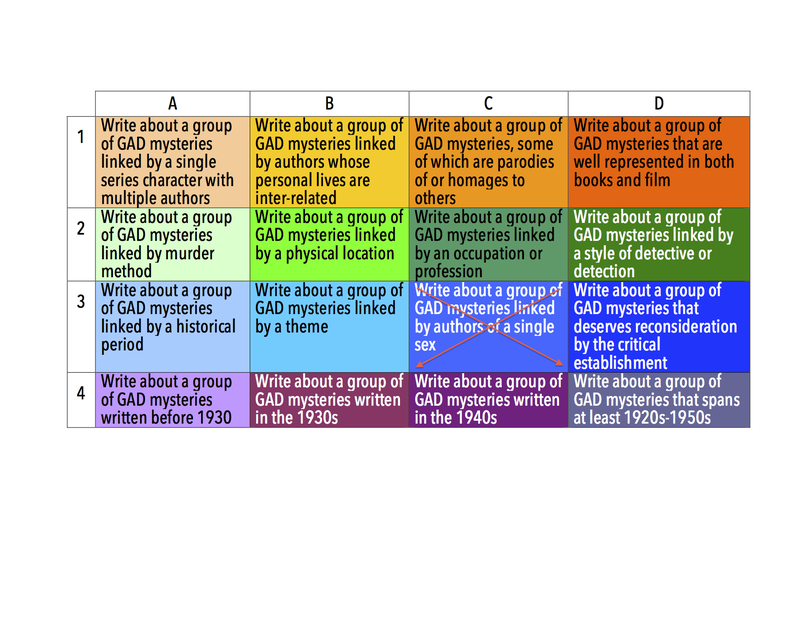 For a chart outlining my progress, see the end of this post.